On April 9, York political science Professor Anna M. Agathangelou was invited to speak at MIT’s Program in Science, Technology and Society. The talk traced the post-1974 humanitarian interventions in Cyprus to redress the problem of the missing and disappeared in a post-conflict society. Drawing on her research for the past 10 years in Cyprus, she spoke to the ways different international institutions and social movements generate data and produce evidence about the missing and the disappeared to imagine the global order and its future. Agathangelou also had an exhibition titled Funeral Oration with a focus on the exhumations as well as “Shards of bones in envelopes and the disappeared and missing of Cyprus” at MIT. This exhibition focused on what exhumations do when they unearth the “loss” and violence post-war. This exhibition brought text and photography of graves together to challenge mainstream and normative understandings of global violence and humanitarian innovations. Agathangelou also delivered a talk at Merrimack College in Massachusetts on April 18 to students in the Women and Gender Studies program on decolonial research, methods and pedagogy. Agathangelou’s focus in this presentation was on the ways classrooms are sites that can and should introduce students to research and decolonial thought, both of which offer methods, modalities and strategies to reflect upon and disrupt colonial modes of relations and pedagogical practices. Both talks were based in Agathangelou’s expertise in global politics, international feminist political economy and feminist/postcolonial and decolonial thought and pedagogies. She is the co-director of Global Change Institute, Cyprus, and was a visiting Fellow in the Program of Science, Technology and Society at John F. Kennedy School of Government, Harvard (2014-15). Agathangelou is currently involved in two multinational partnership research projects funded by the Social Sciences and Humanities Research Council of Canada. 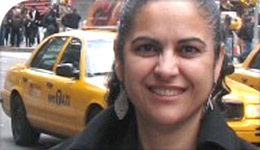 Her work in these projects focuses on sexual violence and human security, global governance and biotechnology. She has researched ethnic conflict in Cyprus, as well as reconstruction in post-conflict societies with a focus on sexual violence, displaced peoples and the missing.